View More In Toiletry Bags. Built with uncommonly thick 24 oz. 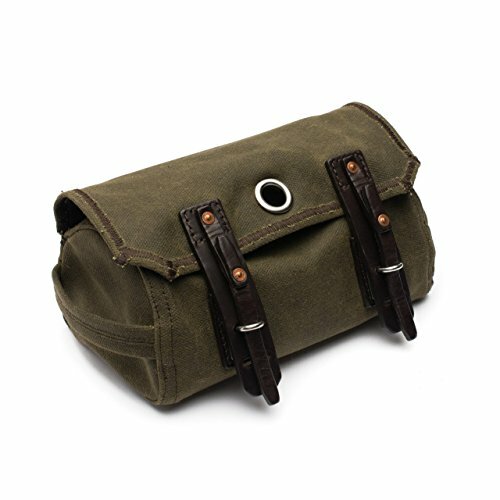 waxed canvas from Scotland, which is extremely rugged and water resistant, the Dopp Kit is a dependable workhorse, built for constant abuse. The Dopp Kit features a leather-reinforced grommet on the flap that can be used to hang the bag for easy access to toiletries or cosmetics. The open interior has a panel pocket across the back with an interior flap riveted on the bottom to further help separate and organize the interior. Recessed edges along the top of the opening help to create a more secure closure with 2 pad eye closures with 3 adjustment slots on the flap closure. Getting in and out of the bag is easy. We took inspiration on our closures, from an old WWII grenade pouch, which gives quick one-handed access into your bag, but still keeps belongings secure. Hand-riveted old bull leather plates along the back and bottom add strength and structure with a canvas grab handle sewn into either side. Whether using at home or on the road, the Mountainback Dopp Kit is an essential item for your toiletries! 1. THE BEST PEOPLE - Our canvas bags are only as good as the people that make them. We have the best sewers, leather workers, and quality control folks in the business. 2. THE CANVAS - Produced in Scotland by the vintage, top canvas makers in the world, our 24 oz. waxed canvas is tough! 3. TANNING PROCESS - We source our exceptional, Vegetable-Tanned, Full-Grain leather from environmentally friendly tanneries. 4. MARINE GRADE POLYESTER THREAD - Our thread is UV and saltwater resistant, the same threading used on parachutes. 5. 100 YEAR WARRANTY - We built this bag organizer to last AT LEAST 100 years. All our designs are field-tested to handle angry crocodiles, stampeding elephants, your daily morning commute and small children. If this Dopp Kit goes before you do, we'll fix it or replace it for free. HEAVY DUTY CANVAS AND LEATHER DOPP KIT - Measuring 5" H x 10.5" W x 5.25" D and made with super strong waxed canvas and thick old bull leather, the Mountainback Dopp Kit is the ultimate travel bag organizer for men or woman. Designed to accommodate a wide range of fixed blade knives for those military folks accustomed to shaving with a combat or survival blade, acting as a cosmetics or makeup organizer is a walk in the park. Hanging feature allows for quick access when traveling or at home. 24 OUNCE SCOTTISH WAXED CANVAS - Waxed canvas is the original water resistant fabric, and has been used for centuries because of its waterproofing qualities. It's the perfect material for a life-long bag. Full-grain vegetable tanned leather straps and plating reinforce all stress points, further bulletproofing this bag. Full grain is the top layer of the cowhide, which is the most expensive and durable part. When you want the highest quality leather that will last forever, always go full-grain. HIGHEST QUALITY MATERIALS - Our canvas and leather bags sure look pretty, but they're as tough as it gets. The Dopp Kit is stitched with marine-grade polyester thread, the same threading used on ship sails and parachutes. We use sturdy copper rivets that are pounded by hand and surgical grade 316 Stainless Steel hardware tested to hold 750 lbs. Built with as few pieces of canvas possible to minimize seams, we reinforce all stress points with extra thick old bull leather. 100 YEAR WARRANTY - We are so confident in the quality of our Mountainback designs, we back them with a 100-Year Warranty. Our company motto is "They'll Fight Over It When You're Dead". And they will probably fight while you're still alive too. When you pass this on down to your kids, they'll be taken care of under our warranty too. THE BEST CANVAS BAGS - When we set out to make the world's premier waxed canvas bags, we enlisted our Saddleback philosophy of using not only the highest quality materials with no breakable parts, but also emphasizing chief standards in design quality. We use super-tough, 24oz. Scottish waxed canvas, and Marine-Grade Stainless Steel 316 hardware. Stress points are copper riveted, fortified with full-grain, vegetable tanned leather, and stitched with UV resistant, multi-filament polyester thread. If you have any questions about this product by Saddleback Leather Co., contact us by completing and submitting the form below. If you are looking for a specif part number, please include it with your message.